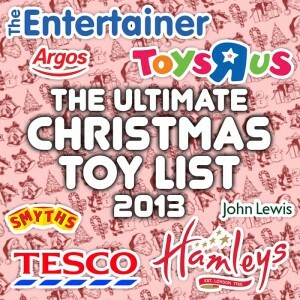 We’ve compiled the ultimate list of top toys for Christmas 2013 based on the sales predictions from Argos, the Entertainer, John Lewis, Smyths Toys, Tesco’s and Toys R Us. Appeared on 3 out of 7 lists. For more information and where to buy visit the review page here. Appeared on 4 out of 7 lists. For more information and where to buy visit the review page here. Appeared on 5 out of 7 lists. For more information and where to buy visit the review page here. Appeared on 6 out of 7 lists. For more information and where to buy visit the review page here.